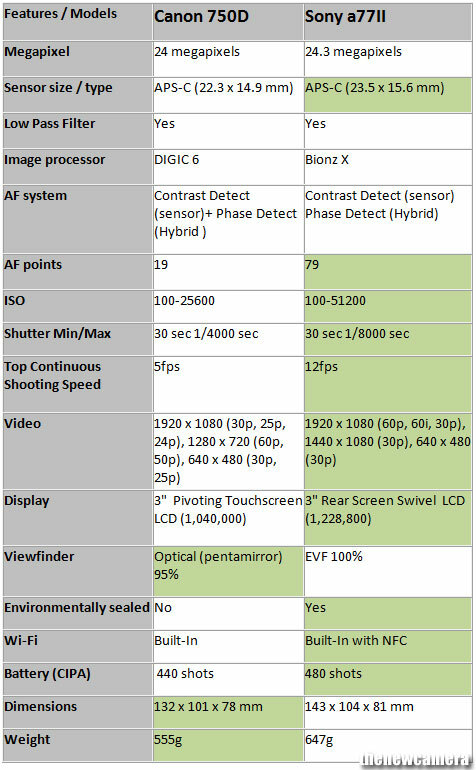 Canon 750D vs. Sony A77II Specification Comparison Table. There is no such huge difference exists in both cameras if we look from above, the megapixel and sensor size remains same. Sony a77II has 24.3 mega pixel APS-C sensor size which is approxi 23.5 X 15.6mm whereas Canon 750D features 24 mega pixel APS-C sensor having size of size i.e. 22.3 X 14.9mm. Both cameras include low pass filter. The Sony A77 II features advance AF module compared to Canon 750D, the Sony A77 II built with a 79 point AF Module and Canon 750D comes with 19 point AF module. So in this regard Sony A77 II will produce iconic images than Canon 750D while shooting a sports event. The Canon 19 point AF module is active only when you are using the optical viewfinder, Now when you are using the live view mode and recording videos Hybrid CMOS sensor Phase AF pixels gets active and with the help of these pixels user will get high speed AF while he is using live view display or shooting videos. The Sony A77 II has fixed mirror inside it, the camera AF module constantly eat some portion of sensor light (10-20%) to acquire AF, hence while you are using the electronic viewfinder or display, the AF module always remains active. But due to loss of light images at high ISO get are bit noisy. ISO range: – The Canon 750D ISO range is limited to 25600 on the other hand the Sony A77 II has one stop more ISO range.. that’s 51200. Theoretically the Sony A77 II will produce better image quality than the Canon 750D, but I will suggest you wait unit we or any other website publish a HIGH ISO test between the Canon 750D and Sony A77 II. Top continuous shooting speed: – Cameras capable of high continuous shooting rates are much desired when subjects is in motion or when you are shooting a sports event. Canon 750D has 5 fps whereas Sony a77II has 12 fps. Display: – If you check the screen size of both the cameras than you won’t find difference in it. Both cameras has 3 inch screen but still there is one difference exists that Sony a77II has rear screen swivel LCD(1,228,800) but Canon 750D has pivoting touch screen LCD(1040000). Video: Both camera can record videos in Full HD mode, the only difference is the Sony A77 II can record videos @ 60fps and the Canon 750D is limited to 30fps, so if you are a videographer you should go with the Sony A77 II. WI-FI and NFC: – Both cameras have inbuilt Wi-Fi, but Sony A77 II is the only camera that arrives with NFC connectivity, the NFC connectivity allows you to easily control your camera with a smart device.. Battery life: – If you charge battery for single time, you can shoot somewhere around 480 shots through Sony a77 II whereas you can shoot somewhere around 440 shots with 750D. So no major difference here… but as you know every single frame matters. Weight: – The weight of Canon 750D is light weight as compared to Sony a77II. The weight of Canon 750D is 555 gram whereas Sony a77II is 647 gram. So we conclude that you can easily carry Canon 750D. Cost Difference – The Body of Sony A77 II camera will cost you approx $948 and the body of Canon 750D will cost you approx $749.. you will save $200 if you buy Canon 750D camera. Verdict: – If we look at the specification comparison table… the Sony A77 II is a clear winner.. however the A77 II is more dedicated for sporting event / photographers those who need more continuous shooting speed and Fast AF, on other hand the Canon 750D is a also a good complete package and will cost your approx $200 less than the Sony A77 II. why the back view of sony A7mkll is showed instead of sony A77mkll? thats a huge difference.